A year after last April’s earthquake in Nepal, Seattle resident and famous Everest guide Lakpa Rita is back at base camp, ready for another climbing season. Last April, Lakpa Rita, head Sherpa for Seattle-based Alpine Ascents International, was eating lunch at Mount Everest Base Camp with no plans to climb any higher. After becoming the first full-time Sherpa guide for a Western outfitter in 1992, he had spent the next two decades guiding well-heeled clients to the top of the world. In 2014, though, he’d promised his worry-worn wife that he was done climbing Everest. Instead, he had returned to the mountain to manage base camp for Alpine Ascents, and that’s where he was when last year’s massive earthquake triggered an avalanche that roared through the tent city erected on the Khumbu Glacier each spring. A torrent of snow and debris engulfed the camp. “I thought the whole glacier was going to sink,” Lakpa said. The quake, which hit on April 25, killed more than 8,500 people across Nepal, including two teenagers from Seattle visiting the area. At least 19 people died at base camp. Lakpa was lucky to escape injury. It was one more Everest tragedy for Lakpa, who has lived in Seattle since 2000. He was on the mountain when the now-infamous “Into Thin Air” blizzard killed eight climbers in 1996. And he was there for the 2014 avalanche in the Khumbu Icefall, which killed 16 Sherpas as they carried loads to Camp One, the first camp above base camp. Lakpa and his brother, Kami Rita, spent hours digging out the lifeless bodies of their friends and colleagues who had been buried. Five were Sherpas he’d hired, and one was his uncle. None of those disasters has deterred him from going back, even this spring — a year after the devastating earthquake and two years after the avalanche — when few people are signed up to climb. Lakpa, 49, grew up in Thame, a small village of about 45 stone houses that has produced many famous climbing Sherpas. He walked four hours to school each way, on footpaths that snaked through the forest. He and his classmates occasionally were visited by Sir Edmund Hillary and Tenzing Norgay — the first people to summit Mount Everest in 1953. Lakpa idolized them. He could see the top of Everest from school and decided back then that he wanted to climb the 29,028-foot peak. In 1986, when Lakpa was 20, his cousin hired him as a porter to ferry loads as high as Camp Three, but no higher. That first season almost turned into his last when he and his partner were caught in an avalanche. While Lakpa loves climbing, it was also the best way for him to make a living. Sherpas can earn $3,000 —$5,000 in a single season on Everest in a country where the average annual salary is $700. Lakpa, as a guide, made more than that. For many, risking death in the mountains is the only way to survive. That’s exactly what Lakpa was able to do. After a few seasons trying to piece work together, he moved his family to a one-room apartment in the center of Kathmandu. Every day, he’d show up at the office of a trekking company hoping for work. He usually walked away empty-handed. Then, at 24, he caught a break. A friend, the lead Sherpa on an Everest expedition, asked him to join. Todd Burleson, owner of Alpine Ascents International, was leading that expedition on Everest’s north side. It was the start of a fruitful relationship between Burleson and Lakpa. While they didn’t make the summit that year, they got along well and Burleson asked Lakpa to continue working for him. Two years later, in 1992, he named Lakpa a sirdar, or leader. While most climbing Sherpas in Nepal work in support capacities, carrying gear from camp to camp, Lakpa managed to become a senior guide, who leads clients to the summit — the top echelon of climbing. One reason he was able to do so was because he went to school and learned English. His relationship with Alpine Ascents allowed him to access things other Sherpas couldn’t back then — especially the technical skills and safety training required for Western guides. Lakpa also overcame the cultural challenge of being able to tell a Westerner what to do and how to do it. In 2000, Lakpa and his wife, Fur Dikee, moved to Seattle for good, settling into a small Queen Anne apartment. They had to temporarily leave their children behind in Nepal. But he also moved to the U.S. so his children could have more choices. His older two children have graduated from the University of Washington, and the youngest is pursuing a degree there. In 2009, Lakpa reached the rocky summit of Mount Kilimanjaro, making him the first Nepalese to climb the seven summits, the highest peak on every continent. Prayer flags fluttered in the wind, and a small group gathered, dancing in celebration. Kilimanjaro? Hakuna Matata! they sang. Kilimanjaro? No problem! Back in Nepal, a poster of Lakpa’s face adorns the side of a Sherpa Adventure Gear store in Kathmandu. The company even makes a jacket named for him. These days, Lakpa still spends seven months of the year guiding all over the world — Antarctica’s Mount Vinson, Tibet’s Cho Oyu — and Mount Rainier, a peak he’s climbed so many times he’s lost count. One of the latest climbs was on a hot Friday morning last September, when he left his purple Kia Sedona in the parking lot at Paradise and slung a heavy pack onto his back. On the trail, every guide he passed, no matter which company they worked for, greeted him excitedly. 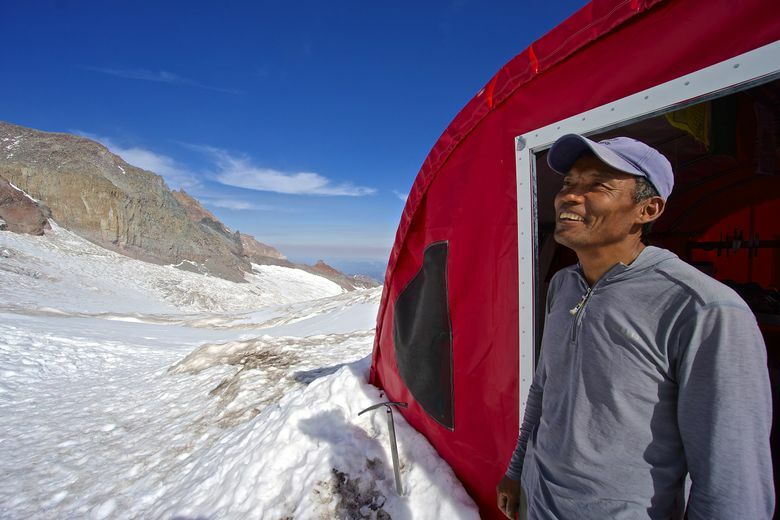 At 1 a.m. he stepped out of his tent at Camp Muir into perfect darkness. With no moonlight, all that was visible were the white dots of climbers’ headlamps zigzagging in space above. He roped up and started walking, ice ax in hand, crampons crunching firm snow — across the adjacent Cowlitz Glacier and up Disappointment Cleaver to a series of horizontal ladders. In the dark, headlamp beams illuminated only the metal ladder and wood plank that covered its rungs, not the deep void of the crevasse below it. As the first band of light hit the horizon, we crossed the rim of the volcano’s crater before ascending to Mount Rainier’s true summit. At the top, he smiled big and offered a hug. The summit is only half the battle, of course. “Most accidents happen on the way down,” Lakpa warned before telling a story about a client who was knocked into a crevasse by a falling boulder earlier that season. Lakpa dug him out and got him safely back to camp. Now Lakpa’s back at Everest, exactly a year after last April’s quake. Alpine Ascents only has two paying clients signed up for an Everest attempt. A normal season sees closer to 10. Still, Lakpa is there to manage base camp. Last month, he was in Seattle making final preparations for the upcoming expedition. He pushed a cart through Costco in Sodo, picking up food he can’t get in Nepal: trail mix, sticks of salami, bacon, corn nuts (the Sherpas love those). At the checkout the cashier noted the substantial amount of cheese he’d picked up. Anna Callaghan is a freelance writer in Santa Fe, N.M.